A beautiful screened porch with a fireplace and outdoor kitchen just a few steps away from the home. Here is the property before we built the screened porch. A large backyard out away from the city. 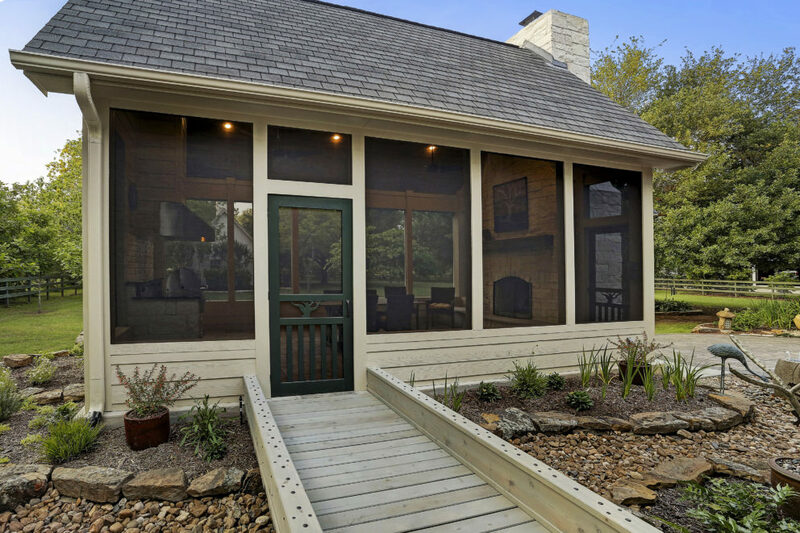 A detached screened porch with a simple bridge to get there. A great way to create a special getaway. The homeowner is skilled in wood shop and custom made the doors. The screened porch is finished off with all of the same material as the home and the wood shop. The kitchen is equipped with a grill and vent hood and has plenty of space to prepare a delicious dinner. The granite counter is Absolute Black and is finished off with Natural White stone and white subway tiles on the back splash. The wood burning fireplace is also finished in Natural White stone and has a cedar mantle. The fireplace opens up to the outside as well for warmth on the small patio area outside. The ceiling is Smokey Bourbon pre-stained tongue and groove and the flooring is a Versailles pattern travertine in silver. A perfect getaway right in the backyard!